The original product, LUBE-A-BOOM, is a grease that is packaged in cartridges, pails, kegs and drums and is also available in an aerosol. It is a synthetic lubricant that contains Teflon (a trademark of Dupont) that is applicable for telescoping booms, i.e. cranes, tele-handlers, aerial lifts, boom trucks and other types of equipment, as well as applications that have sliding surfaces. LUBE-A-ROPE aerosol is for wire rope, cable and chains. It contains molybdenum (moly) and graphite. This is an excellent product that penetrates, as well as, providing a lubricating film for longer life. LUBE-A-BOOM DRY FILM aerosol is a dry type lubricant that uses moly to provide lubrication for applications where a wet type product is not preferred. A lot of the time, it is used in dirty environments where dirt and other foreign elements exist. This product is ideal for extendible outriggers, extendible counterweights, boom applications, forklifts and various other machines. Also, it can be used on external teeth or rotating bearings when an open gear type lubricant is not applicable. It is important to note: when using any dry film product, be sure the surface is clean and dry so it adheres. LUBE-A-GEAR aerosol is an asphaltic open gear lubricant for turntable bearing applications. This product provides a cushion between gears for protection. 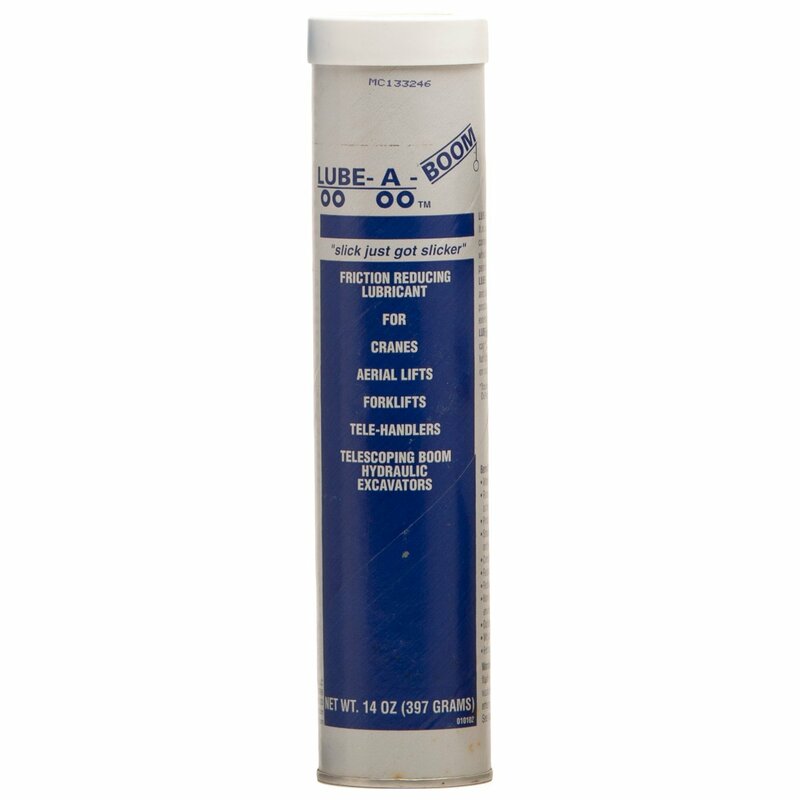 LUBE-A-BOOM CLEAR aerosol is exactly what the name implies: a clear aerosol formulation that includes silicone for sliding surfaces, linkages, latches and multiple applications. It can also be used on many different rubber materials to help them keep their resiliency. LUBE-A-PIN lubricant is a synthetic grease product that contains 5% moly. It is a heavy-duty product that can extend the life of pins, bushings and bearings. It is formulated to handle heavy loads and shock loads. This product comes in cartridges, pails, kegs and drums. 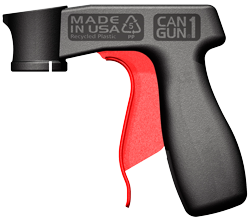 GUN1 spray tool is easy to use and attaches to most aerosol cans. It has a large trigger that allows the user to use it with gloves on. Its popularity stems from the fact that the user does not get any product on his or her finger(s) and does not tire from pressing down on the nozzle. It is advisable that when changing brands of products, you remove or purge as much of the old grease as possible until the new product takes over. It is recommended that the greasing interval be reduced by 50% for the next lubricating schedule and then you can resort back to the OEM recommendation (hours or miles). Going forward you can establish your own interval pending results and performance of the new product. When using either the LUBE-A-BOOM or LUBE-A-PIN grease products it is a good practice to remove all dirt and grime from the zerk fittings to make sure you do not contaminate or plug the fitting. Pump enough grease into the joint, bearing or bushing until you see grease coming out. This way you are pushing out the old grease and any contaminants. Caution should be used on over greasing where rubber boots are used, as not to damage them. Greasing a boom is normally done by brushing or rolling the grease on with a paint roller. Over greasing for this application will result in a waste of product and resulting mess since excess grease will fall off the boom when it is telescoped in. This can be a safety issue, especially if the lubricant falls on walk areas. After applying the grease, the boom should be telescoped in and out to make sure the grease covers the full length of the boom sections. It is important that the inside wear pad areas be lubricated as well. Depending on the boom design, this can be difficult and may require some ingenuity to get into tight spaces. The use of LUBE-A-BOOM AEROSOL is often used for this area and it is compatible with the LUBE-A-BOOM grease. Aerosols are formulated as mentioned above for different applications. Each aerosol has its own spray pattern, which is designed for most applications. It is recommended you try the product on a small area to see how it performs. The amount of product used will vary based upon the application and environment. All LAB aerosols are environmentally friendly, containing no heavy metals such as lead, antimony, etc. However, they are not food grade. Follow the manufacturer’s recommendations regarding specifications and intervals. When using other products such as LUBE-A-BOOM, it is not unusual that the interval can be extended. You can determine this by recording and monitoring each lubricant in your maintenance program. Wear proper protection when using any lubricants. Normally this includes safety glasses, proper clothing and a respirator, along with other safety items such as hard hats and steel toe shoes. Do not use aerosols around electrical or open flames since they are flammable. Avoid contact with eyes and skin. For a medical emergency call the number on the label: 800-535-5053. Maintaining your equipment and using the proper lubricants extends component life and maximizes equipment utilization that results in more profit and less money spent on repairs. Using friction-reducing lubricants aids in this process, and when used correctly can have long-lasting results. LAB, LLC is continually looking for new applications to better serve the construction and industrial equipment market, so visit the website or provide your email address for updates. And if you are interested in purchasing one of the LUBE-A-BOOM products, please visit the e-commerce department page or contact one of Runyon Equipment Rental’s sales reps here.